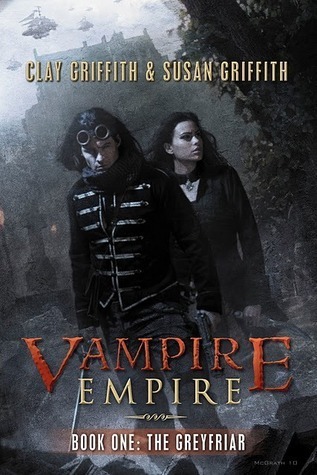 Book summary: Vampire predators run wild in this exciting steampunk adventure, the first in an alternate history trilogy that is already attracting attention. In 1870, monsters rise up and conquer the northern lands, As great cities are swallowed up by carnage and disease, landowners and other elite flee south to escape their blood-thirsty wrath. One hundred fifty years later, the great divide still exists; fangs on one side of the border, worried defenders on the other. This fragile equilibrium is threatened, then crumbles after a single young princess becomes almost hopelessly lost in the hostile territory. At first, she has only one defender: a mysterious Greyfriar who roams freely in dangerous vampire regions. Our review: Just when the vampire-loving fan inside of me was losing faith with some of the recent bloodsucker books available, I discovered a gem: Vampire Empire, Book One: The Greyfriar. I'm stoked to admit my faith in the tired genre has been restored! After an intense weekend of reading whenever I could, I LOVED this book and was surprised by what I found on its pages. Clay and Susan Griffiths have created a dynamic vampiric creature that is incredibly powerful and terrifying. These beings don't shine or make females swoon over their otherworldly looks--they are what they were originally were: MONSTERS. Finally! When we first meet Princess Adele of the Equatorian empire and her younger brother, Simon, on board a ship preparing for a political trip, they are attacked by horrific bloodsuckers from above. Yep, these fanged vamps can float and fly. All I could think was how scary but utterly cool. When Adele, a strong-willed young woman, is separated from her group, she has no choice but to fight the creatures whose leader wants her kidnapped. In steps a fabled hero--the Greyfriar--to intervene on her behalf. Adele thought he was a myth but his lightening fast moves and the adept way he handles his sword tells her he is quite alive. The first round goes to Greyfriar and Adele, but don't discount the vampires yet. Adele was refreshing. She was young and naive to an extent (due to her upbringing), but she was also schooled on the ancient ways of sword fighting and the martial arts by her tutor, Mamoru. I really had a sense of who she was and what she stood for throughout the story. When she is helped by and then escorted by the famed Greyfriar, she admires him for his skill. The masked man is a secret to her yet Adele finds him interesting. Their relationship grows and intensifies throughout the novel and thankfully never gets bogged down in romantic cliches. The two develop a mutual respect for each other. When Adele is kidnapped and taken to the headquarters of Cesare (the vampire king's son), she soon meets his brother, Gareth. Gareth claims as the eldest and the rightful heir, the prisoner is his. Adele learns he is not like the others. Over time she discovers he has humanistic qualities and a yearning to understand mankind. For the second time since her downfall she has met a surprising man. Greyfriar has wonderful twists of events I will not spoil and three characters to care and root for. Adele, Greyfriar and Gareth make this story unique. What I enjoyed the most and made me turn the pages continually were the quieter passages between Adele and Greyfriar and Gareth. Their interactions gave this story heart. The vulnerability of these characters was gratifying to see. The worldbuilding was well constructed and the steampunk tendencies were never overly done. The secondary characters were well developed and I expect to see many of them return in the second book. Greyfriar was an unexpected and delightful surprise. The Greyfriar is an exciting, absorbing thrill ride of a book. Fans of the supernatural/paranormal/fantasy genres HAVE to read this book. Favorite excerpt: "Greyfriar leaned forward. "But don't you find the challenge incredibly satisfying? Using your hands." He extended his arm and worked his gloved hand as if manipulating a sword. "I never tire of it." "Yes, definitely. It was worth every aching muscle and reprimand." She raised her eyebrows in mock conceit. "I was taught by a master swordsman from Japan. And I fancy myself an excellent swordswoman. Or I did until I saw you in action." "No, don't think that. I've told you before. You are most extraordinary." Greyfriar said, "Your instincts are excellent, but your blade work needs more control. That is merely a matter of practice." Now she pursed her lips in mild annoyance. She hadn't been expecting criticism. He continued, "Still, I have spent many years among vampires, and among those who wish to kill them. I have never seen anyone like you. You sense the world around you in a way that is . . . unnatural." He laughed. "Like a vampire. You feel rather than see." "I'm not sure that's a good thing." "It's neither good nor bad. I marvel at you. I have from the beginning. I can tell you were born to it. With some final honing, you will be fearful to behold." Adele couldn't catch her breath at his words. "Well, I . . . uh . . . thank you. I wonder why my teacher has never told me anything like that." Cover comment: The somber grey and black of this picture of Adele with Greyfriar is a testament to the relationship they share inside the book. Book source: Loaned from library. I love this book soooo much! I cannot wait for the second part to it. Great review! I loved it too. Thanks!